One of the most iconic trekking events in the UK, The National 3 Peaks Challenge involves climbing the three highest mountains in Scotland, England and Wales within 24 hours. The challenge covers 42kms and involves 3,064 metres of ascent. Despite the popularity of this challenge, you shouldn’t under estimate the difficulty of this event. You will be accompanied by a fully experienced and qualified Adventurous Ewe Mountain Leader throughout the event and transferred by your own private driver in a mini-bus. If you have a group of over 10 trekkers, we can tailor the challenge to your requirements such as N3P in 48 hours or 72 hours. 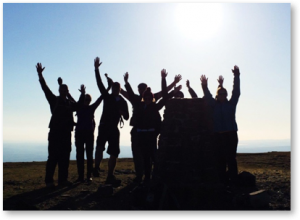 We’re here to make this iconic UK mountain trek a great success for all involved. We operate this iconic trekking challenge between the months of May – September and can also arrange alternate pick up and drop off locations for your group. For more information please contact us at email: info@adventurousewe.co.uk or call 01492 588 069. All travel arrangements and pick up/drop off locations are flexible within reason. We can also provide a pick up service en route from North Wales to Fort William if you live along the way. Please contact us for details. Arriving at Snowdon around 1pm, Our final challenge takes on the highest mountain in Wales, Snowdon or Yr Wyddfa in Welsh, standing at 1085m. Snowdonia is unique for its bio-diversity of plants and wildlife and with breath taking views from the summit is a great end to the last of your 3 peaks. Our ascent route will be on the Pyg track which rewards us with those classic Snowdon views. The ascent should take approximately 2hrs. Once on the summit we will have time for a photo and enjoy the views before starting our decent down either the Llanberis path or the Pyg Track. The descent should take approximately 2hrs. Arriving at our hotel for a night of celebration. Upon completion of your challenge if you need to travel home we can arrange a transfer to Bangor or Chester which has good rail links to all parts of U.K. We can also arrange a private coach transfer for the group either on Sunday or Monday after completing your challenge. Please note timings are approximate and depend greatly on the group. All times are set trying avoid walking in dark as this will slow the group down, especially in poor weather, with large groups we find that the best option is start your 24hrs at the base of Ben Nevis and finish your 24hrs on the summit of Snowdon, this does not mean that fast groups cannot reach the base of Snowdon within the 24hr period.